I will go to just about any event that offers free food. The College-Institute advertises a lunch and learn with free food; I am one of the first RSVPs. The synagogue plans to run an evening meet and greet with light hors d’oeuvres; I am the first to volunteer to meet, greet, and — of course — eat. Food motivates a lot of what I do. But food is not everything. For my first birthday as a resident here in Cincinnati, I invited most of the people I knew in the city, which was a pretty small circle of friendly faces. But one by one they started to cancel their plans to come to the Shabbat dinner birthday party. I was left with all of the food, not much in the way of community, and a pretty grim outlook on my birthday. This particular birthday happened to fall on a Friday night, so it was not just about food or my birthday, but about Shabbat. That lonely Friday evening was when it all changed. That is when I realized it was time to expand my community; the promise of good food and even a birthday celebration was not going to cut it. It would take about a year to get things rolling, but soon, my husband and fellow rabbinical student, Max Miller, and I began to fill our home week after week, Shabbat after Shabbat with home-cooked food and fabulous community. As we expanded our community and realized the number of people coming through our home, we started to hear whispers from our friends outside of HUC-JIR. They were asking more questions about Judaism, and they were looking for ways to engage Jewishly in the community. For our Jewish Foundation Fellowship this year, Max and I initiated a pilot program known as “The Table.” Our dream with this initiative is to partner with Jewish Young Professionals (JYPs), people ages 22–35 who are out of college but have yet to start families, to celebrate Shabbat in their homes throughout the city. The Table is all about sharing a delicious home-cooked Shabbat meal, being with new and familiar friends, and talking about the issues that matter to those at The Table. The only thing our participants need to bring to The Table is themselves, open minds, and healthy appetites for good food. We set The Table to create a space where JYPs can engage with Judaism on their terms and bring those experiences home. I am certain that no one comes to these dinners simply to attend a nice dinner party; there must be a secondary motivation to get a young adult in the door on a Friday night. People are coming with more than one kind of hunger. Our guests crave Max’s challah, but many of our young adults in this area, and across the US are hungry for something else. Our guests are hungry to be part of something bigger than themselves, to feel valued, and to not only feel a part of community but to feel moved by that community. With the powers of social media and apps like Meet-Up — and dare I say Tinder, Grindr, or J-Swipe — people can search for a community at the touch of a button or a swipe to the left or right. You can even form a community without ever leaving your computer, or you can use your computer to find the kickball club, acro-yoga, or trivia group in town. But these clubs and communities are not where young adults are confronted with meaning-making opportunities or a sense of connectedness to something bigger. Despite tons of opportunities and events for young adults that happen on Friday nights, The Table — the Shabbat table — is continually full. So what is missing from those other Friday night opportunities? The feeling of judgment-free inclusion and the doubt-free knowledge of belonging. Those other events tend to lack space for participants to feel like others truly see them. They are absent of prayer and of historical ritual that connects participants to a religious tradition that is meant to be discussed, challenged, and engaged. In our era of fractured identities, Judaism can be a grounding influence that allows [us] to try on other identities without losing [our] sense of self. Without being in an interrelated or interconnected community, one starts to lose his or her sense of self. In high school, our parents, a youth director, a friend, or a rabbi may have reached out to us and sent us on our way to Jewish events. It could also be that we were without these influences, and we did not engage with those communities. But as we grow older, those choices are now on us as individuals, and on the community of young adults who have the autonomy to both reach out and to turn within. Those who are already Jewishly engaged should seek opportunities to reach out, to find those who are in search of community, and to have an ear open for moments of hospitable invitation. One of our most talked about biblical characters, Abraham, is known for his outreach, engagement, and hospitality. In Parashat Vayeira, Abraham and Sarah open the tents of their home to the visiting angels, the beginning of their hospitable reputation. In Avot D’Rabbi Natan 1:7, we learn that the hospitality of our biblical character, Job, was “not even one-half the standard of hospitality displayed by Abraham.” So why was Abraham’s hospitality greater than Job’s? The text further tells of how Abraham went out in the world and met those who passed by and brought them into his tent. He even reached those who were unaccustomed to all the different foods and drink that he had to offer. Avot D’Rabbi Natan refers to “the poor,” but we can broaden this category to include all who pass through our community. We learn from the hospitality of Abraham that it is our obligation as Jews to bring people in and make them feel a part of our group, of our people. When we declare, “I am a Jew,” we establish a connection to the millions of Jews who came before us. This is the peoplehood, the attachment to a group, the movement from “I” to “us.” Meaningful connections, like the ones Abraham makes with those who pass by, are the connections that can change our lives. When someone reaches out to us, we feel seen and valued. This sense of value helps us define our purpose and drives our path forward toward discovery and meaningful existence. I have been blessed with many such interactions, and there is one story in particular that I hold very dear. When I was in college, figuring out my latest choice in major at my latest choice in university, I was talking to my mom on the phone about the Jewish studies program. I hung up, turned around, and encountered a nice young man who seemed to have a question for me. He said, “Sorry for eavesdropping, but are you Jewish?” I gave him the affirmative, and he handed me treats for the holiday of Purim, mishloach manot. This encounter led to an invitation to a Shabbat dinner that in turn led to many more days and evenings spending time with the small Jewish community on my college campus. I had just arrived on campus as a transfer student in the spring semester of my first year of college. As I walked around feeling completely lost and disconnected, the Jewish community found me, I found the Jewish community, and I felt like I belonged to something again — all because I was passing by, and someone brought me in. Just last week I felt like I was able to pay this sort of hospitality forward. I was sitting with a number of colleagues at Coffee Emporium downtown doing homework when a young man must have noticed Max’s kippah. He approached our table and asked if we were Jewish. He said he just moved to town and was still trying to figure out what all the young Jews in town were doing. We chatted for a bit, got his information, and genuinely followed up: connected him with the right groups, invited him to the next Shabbat dinner, and let him know that if he needed anything to help him adjust to Cincinnati, we were here for him. 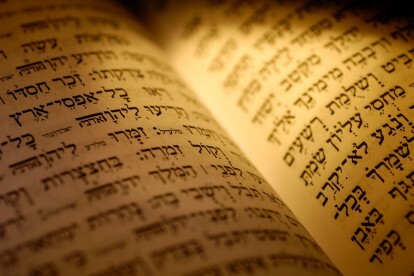 There is still a plethora of reasons for young adults to stay Jewish and to embrace Judaism. We just have to find the reasons for them to tap into that potential because, once they do, the community’s life will be prolonged and the future of the Jewish people will continue. Our pilot program for The Table is just one place where we can tap into that potential, but we must continue to look for opportunities to connect, to reach out, and to be that grounding influence in the life of a Jewish young adult. In our era of fractured identities, may we all be like Abraham, may we all encounter his hospitality, and may we all ground ourselves in a Jewish identity that is full of authentic experiences where we connect to something greater than ourselves. Rachael Klein Miller is a fellow for The Table, a Shabbat dinner initiative for Jewish young professionals in the Cincinnati area started by her and her husband, Max Miller. This essay was adapted from her senior sermon.